HPP is an inherited disorder, which means the cause of HPP can be traced back to your genes. Genes hold the information to build and maintain the cells that make up our bodies. Genes contain the instructions to make certain molecules called proteins. Some of these proteins, called enzymes, help facilitate body processes (such as building bones). One gene makes an enzyme called alkaline phosphatase (ALP). In people with HPP, this gene is abnormal (or mutated), resulting in low levels of the ALP enzyme. 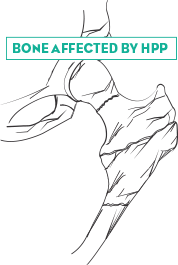 In people who do not have HPP, the ALP enzyme helps build strong and healthy bones. Specifically, ALP changes inorganic pyrophosphate, a molecule that normally prevents bone formation, into 2 phosphate molecules that help bone formation. These phosphate molecules bind together with calcium to mineralize bone. Bones change and rebuild themselves continually over a lifetime—which keeps both the bones and the body healthy. In HPP, ALP is low, so less phosphate is available to bind with calcium and create strong bones. 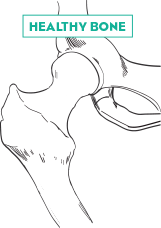 Therefore, in people with HPP, bones can be soft or weak. Because bones rebuild over a lifetime, the impact of low ALP is ongoing and prevents healthy bones from being maintained. In people with HPP, calcium and inorganic pyrophosphate can build up in other parts of the body such as the kidneys, muscles, and joints. This can cause damage to organs and may lead to bone, muscle, and joint pain. Because HPP is an inherited disease, multiple people in the same family may have it. If you have HPP, your family members may want to speak with a doctor about being tested for HPP. Alternately, if you are having symptoms of the disease, you may want to speak with your doctor about being tested for HPP.